Purple Martin Houses on Sale! Wanting wild birds in the view of your backyard? 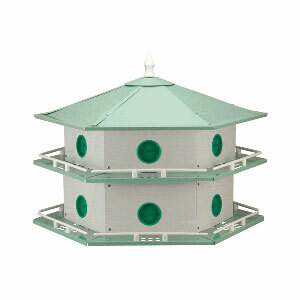 Lochte Feed has Purple Martin Houses on sale! The Purple Martin is the largest North American swallow. They have speed and agility in flight, and when approaching their housing, they tuck their winds and will dive from the sky at great speeds. Purple Martins spend the non-breeding season in Brazil then migrate to North America to nest. East of the Rockies they are totally dependent on human-supplied housing. West of the Rockies and in the deserts they largely nest in their ancestral ways, in abandoned woodpecker nest cavities. In the Pacific northwest, Martins are beginning to use gourds and clusters of single-unit boxes for nesting. To read more about Purple Martins, Visit purplemartins.org. This entry was posted on Monday, April 21st, 2014 at 3:33 pm	and is filed under News & Updates. You can follow any responses to this entry through the RSS 2.0 feed. Both comments and pings are currently closed.